Farmers in the region are concerned over the inclement weather. 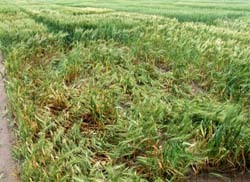 Although the rain and low temperature are considered to be good for wheat as this will delay its early maturing, but the winds that are accompanying these rains have reportedly caused damage to the crop at several places. The Association for Democratic Rights (AFDR), Punjab, has taken a serious note of the “anti-people” state policies contributing towards commercialisation of education, health and other civil amenities, which has been declared as fundamental constitutional rights to every citizen of India irrespective of their socio-economic status, caste or creed. Dr Darshan Kheri, newly elected general secretary of association, said the issue was discussed in a meeting of the AFDR held under the chairmanship of Professor Jagmohan Singh. Sumer Singh Gurjar here today took charge as Deputy Commissioner, Ludhiana. He replaces Ashok Kumar Gupta, who has been appointed special secretary, department of education, Punjab. On his arrival at the mini-secretariat, Gurjar held an introductory meeting with the officers of the administration and sought first-hand information about various ongoing projects in the district. Prices of school books and note books are all set to rise as printers are planning to increase prices. This is happening as paper mills are increasing the basic price of paper and paper board between 15 per cent and 25 per cent. This will directly affect our industry, said general secretary of the Offset Printers Association Kamal Chopra. 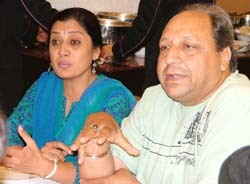 The secretary Punjab Pradesh Congress Committee Parminder Mehta has hailed the appointment of former chief minister and senior party leader, Rajinder Kaur Bhattal as the Congress Legislative Party leader. She would also become the leader of the opposition in the state assembly. Punjab minister for jails and Shiromani Akali Dal (Badal) legislator from the Ludhiana rural segment Hira Singh Gabria has said that the SAD-BJP government will fulfil all its promises made to the electorate. With the Shiromani Akali Dal-Bhartiya Janata Party alliance replacing the Congress in the state the real estate prices have started to fall. The real estate dealers were already apprehensive of the change of guard as general perception remains that during the Akali rule the property prices come down considerably. "Through our current serial ‘Maayaka’ running on Zee TV, we have tried to perpetuate all good values among the young so that they become good people. Through the feedbacks we have received, people have reacted favourably to it," said Sudhir Pandey and Nandita Puri, acting as Brij Malhotra and Mohini Malhotra in the serial. Nandita Puri and Sudhir Pandey, lead characters of the serial ‘Maayaka’ on Zee TV, address a press conference in Ludhiana on Monday. It takes more than two years for the Ludhiana municipal corporation to recarpet a road as important as an approach road to the Civil Hospital that is used by a number of patients everyday. Speakers at a seminar sought to dispel certain myths and misgivings about Islam and said the religion preached peace and brotherhood. Several leading litterateurs were honoured with late Kartar Singh Dhaliwal prize at a function organised here by the Punjab Sahitya Academy at Punjabi Bhawan yesterday. The Excise and Taxation Officers’ Association (ETOA), while reiterating its commitment to achieve the targets of revenue collection for the current financial year, has decided to take up the crucial matter of evasion of taxes and the resulting loss of revenue with Chief Minister Parkash Singh Badal and senior most officials of the department. The house of Raj Singh of Pakhowal village was allegedly burgled by some unknown persons. The burglers stole Rs 2,000 in cash, one gas cylinder and a VCD player from the house. Students of the Department of Business Management, Punjab Agricultural University, Ludhiana, could not have asked for a better deal. With the number of jobs offered exceeding the strength of students in the department this year, many companies had to return without being able to get any recruit. Taking cognizance of reports of uneasiness at the examination centre at Government Senior Secondary School, Chakohi, in Ludhiana district, the district education officer has deputed principal Varsha Shukla to supervise the functioning of the centre. Instrumental Music Department of the Government College for Women organised a music competition in Sitar recital at the undergraduate and postgraduate levels. About ten students from the post-graduate and an equal number from the undergraduate level took part in the competition. A mini cartoon land was seen at the fourth annual day function of Mother's Touch Kindergarten. Cartoon dance by students of Mother's Touch Kindergarten at its 4th annual day celebrations on Monday. — Photo by I.V. Sessions judge Harbans Lal has acquitted Ganpat Rai of Salem Tabri of the charges of causing death to his father Chaman Lal in August 2005 as the prosecution witnesses turned hostile. Harish Narang has been unanimously elected member of the Bar Council of Punjab and Haryana. This was announced by Navtej Singh Toor chairman bar council. Ivanna Institute of Fashion Technology organised an art and craft competition ‘Kala Kriti' for its students here today. Students put their imagination to use in making articles in the various categories of home craft, soap craft, paper craft, moulding craft, fabric craft, glass craft etc using various products. Dhanveer Singh, who worked in a guest house in Mussoorie, met with an accident and sustained a spine injury paralysing his legs, along with a fracture in his right thigh bone near the hip joint. He was referred to Christian Medical College and Hospital (CMCH) here after he developed difficulty in breathing due to collection of fluid in his thorax. 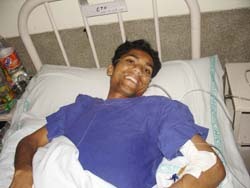 A beaming Dhanveer Singh, who suffered serious spine injury, paralysing his legs, at the CMCH in Ludhiana on Monday. Photo: I.V. Christian Medical College and Hospital (CMCH) conducted its annual multi-speciality free health check up camp at Rauni village, near Khanna, today. 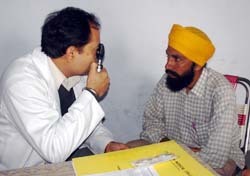 An eye specialist examines a patient at a free medical camp organised by the Christian Medical College and Hospital at Rauni village on Sunday. Bharat Vikas Parishad Charitable Trust Punjab, Rishi Nagar Ludhiana inaugurated a dental wing at Kahan Chand BVP polyclinic. This wing has been donated by Kamal Sharma and family in the name of their mother Suhag Rani. Hosts Ludhiana and Muktsar recorded easy victories in the men's section of the 58th Punjab Basketball Championship which began at Guru Nanak Stadium here today. Ludhiana cagers drubbed Nawanshahr 103- 23 while Muktsar thrashed Ferozepur 79-36 to commence their campaign on a sound note.